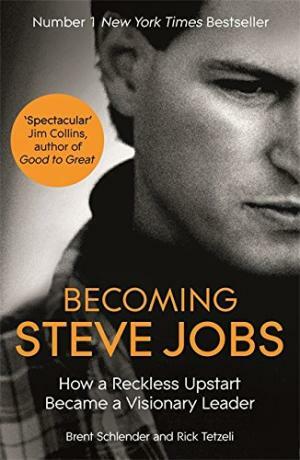 Becoming Steve Jobs: The Evolution of a Reckless Upstart into a Visionary Leader by Brent Schlender & Rick Tetzeli tells about the famous entrepreneur by two people who knew him. Mr. Schlender and Mr. Tetzeli are journalists who have interviewed Mr. Jobs over many years. Almost everyone have heard of Steve Jobs, we read profiles, saw movies and heard “things”. Everything we know though, usually tries to peg a person as a genius, a misunderstood inventor, a horrible dad, a jerk or some other kind of label. People aren’t labels, we’re complex and we change our mind and our behavior. Becoming Steve Jobs: The Evolution of a Reckless Upstart into a Visionary Leader by Brent Schlender & Rick Tetzeli is a thought provoking book about a very complex man who almost defies categorization. The two journalists have interviews Mr. Jobs many times over the year and wrote a perspective, intelligent book about a man not many understood. I liked the way the authors approached the writing, they combined their experiences into one narrative which I found to be straightforward and understandable. After all, the book is about Steve Jobs, not the authors. The authors are not only journalists, they also know and understand the industry which they’re writing about. I felt that experience gave the authors and the reader a perspective which otherwise might have been lost. This book is a comprehensive look at Jobs’ life, not just his time in Apple. By the time Mr. Jobs passed away he was already an icon of American business. This fascinating book about a fascinating man shows him in all his complexity and genius.